Last week Newsweek published an excerpt of Dr. Eben Alexander’s book, “Proof of Heaven“, as its cover story. I’m already familiar with Dr. Eben Alexander’s NDE (Near-Death Experience) case because I’ve listened to his interview on Skeptiko last year. However, I don’t know the exact details of his case and the “proof” that he offers since I haven’t read his book yet (it’s not yet published as of this writing). Also, I’m not a big fan of the title of his book. “Proof of Heaven” sounds very unscientific to me, preposterous even, and I know that it would instantly trigger a backlash from the scientific and skeptical communities. (Maybe that was the purpose of the publisher anyway!) Nevertheless, I tried to stay open-minded on what he has to say since his credentials are impressive and he seemed sincere on sharing his experience and his purpose of writing his book. Really?! Sam had the time to write that blog post (which I assume took him more than an hour) and he even consulted his thesis adviser, but he can’t spare an hour of his time to get the details of Dr. Alexander’s case? Gimme a break, Sam! Here’s the thing. I understand that this thing cannot be settled in a debate anyway. However, I’m willing to put my bet on Dr. Alexander that he understands what he’s talking about better than Sam Harris. I’ve seen Dr. Alexander’s credentials and it’s longer than my arm! Don’t get me wrong, just because Dr. Alexander has the credentials doesn’t mean that his conclusion is right. This is not an argument from authority. This is an argument from credibility. In my opinion, Sam has *forfeited* his credibility by not facing Dr. Alexander in a debate. What Sam did was a *speculative drive-by shooting* without knowing the medical facts of Dr. Alexander’s medical case. And then he just proclaimed that that is “the end of the debate”? How convenient! That’s an argument from proclamation. That’s not very scientific of Sam. That’s speculative bias at best, and intellectual dishonesty at worst! So, yes, Sam. By backing down from the debate you just contradicted your own principle. End of discussion. Bottom line: This is an EPIC Sam Harris FAIL! This is a new low for Sam. I thought that the “Profiling” fiasco was already low. But this one sets a new record! Maybe being schooled by security expert Bruce Schneier was already too much for Sam. That’s why he’s not able take another schooling by a very credible neurosurgeon. I’m just speculating here, of course! I hope Sam Harris reconsiders. I’d like to see him display his principle of open-mindedness–the thing that I admired about him when it comes to the mystery of consciousness. Until then, for me, Sam Harris’ credibility as a neuroscientist and a critical thinker is now down to zero. P.S. Dr. Eben Alexander was also featured in Season 2: Episode 1 of Through The Wormhole. You can watch it here. I am instantly put off with the sensationalist title and headline, ‘Proof of Heaven’ and ‘Heaven is Real’. Right on the money. I really enjoyed the episode of “Into the Wormhole” at the end. I could not help but notice the image of Alexander’s brain in the CT scan he was viewing on his laptop had something that looked remarkably like a butterfly at 6:33. Excellent writing! I enjoyed reading your post. Dr. Eben Alexander’s book was just published today. i downloaded it on Kindle. this interview was conducted a few weeks ago before Sam Harris and other so-called Atheists went into a hysterical attack against Alexander when excerpt of his book was published on Newsweek. IF we accept subjective experiences as proofs then Dr. alexander,s one is refuted by GOD,s revelation in the Quran……NO one can escape the imprints of his deeds on his soul , good and bad can NEVER be equal or else the cosmos itself would be in vain. however, the more i read Dr. Eben Alexander’s book, it is now clear to me that Sam Harris was the “lazy and tendentious” one for going on an all out knee-jerk reaction without having the details of Alexander’s medical case and how Alexander went through a painstaking process of attempting to find a neuroscientific explanation for his *rare* medical condition and *spontaneous* recovery. any budding neuroscientist (like Sam Harris) ought to be interested in Alexander’s fascinating medical case, NDE or no NDE. here’s another good critique of Sam Harris’ knee-jerk, lazy and tendentious overreaction to Dr. Alexander’s book excerpt on Newsweek. Sam Harris tries, and fails, to critique Eben Alexander’s ‘Heaven Is Real’ piece. Just because you’re a neurosurgeon or EVEN a neuroscientist the mind could deceive even you! I’m sure the first time an Oncology doctor has cancer he experienced things never before expected. How do you know it wasn’t Zeus or Mohammad talking to you “up there”? Don’t tell me this confirms chritianity in anyway shape or form….you’re really trying to cashout on this “dream” huh? your statements have no substance. read the book. then let’s talk. until then, you are just embarrassing yourself for making baseless statements. “In Dr Alexander’s case he was very close to death while in intensive care. In fact, in a discussion with Dr Alexander’s family, his doctors discussed stopping the antibiotics as it seemed unlikely that he would survive. From my 17 years experience of working as a nurse in intensive care this is something that would be discussed if it seemed futile to continue with them. This in itself highlights the severity of Dr Alexander’s condition. “The fact that Dr Alexander’s brain was severely dysfunctional yet he recalled a highly structured, lucid and heightened state of awareness during this time does not sit well with science’s current beliefs that consciousness is a mere by-product of the brain. My first time when i see it, and i think its just a new way of getting more dr details..NO one can escape the imprints of his deeds on his soul , good and bad can NEVER be equal or else the cosmos itself would be in vain. i therefore conclude, Sam Harris is an intellectually dishonest person and a pseudo-skeptic on the topic of NDE. he now has ZERO credibility on matters of psi and NDE in my book. listen to this podcast episode for more context. thanks to @Alex Tsakiris for exposing Sam’s ignorance and arrogance on psi and NDE. now, with regards to the medical case of Dr. Alexander, the issue there that needs to be debated is how can Alexander have an ultra-real experience during his coma and even have a clear memory of it when brain science tells us that this should not be possible (e.g. Alexander’s neocortex was “offline”. he claims that he have the medical record and brain scans to prove this). BUT my point is, it doesn’t matter what the content was! it could be a memory of another lifetime, or a life in other civilization, or even an extra-terrestrial abduction! the technical point it is this: how can a brain with an offline neocortex “generate” those ultra-real experience? Sam’s speculation is that it was possibly due to DMT dump. fine. ok. maybe. BUT, Alexander considered that hypothesis and even discussed it with other neuroscientists and he says that a DMT dump is very unlikely. considering just this one hypothesis, who between Harris and Alexander understand neuroscience better? that question can be answered in a debate or a discussion. alternatively, what is Sam’s hypothesis on how is it possible that Alexander could have an ultra-real experience and complete memory of his NDE? will Sam’s hypothesis stack up with Alexander’s 9-point hypothesis? will Sam’s hypothesis explain Alexander’s experience in neuroscientific terms? that is the area of debate that I would like to see. that said, i will conclude this post with a quote from my dharma grand daddy, Joshu Sasaki Roshi–the oldest living Zen Master. another point i want to bring up (which is the Elephant in the Room in Sam Harri’s blog post) is this: Sam Harris extensively quoted Terence McKenna’s DMT experience to debunk Dr. Alexander’s NDE. but anyone who is familiar with Terence McKenna knows that McKenna was antagonistic against scientific materialism and reductionism. McKenna had a whole different model of reality which is the anti-thesis of scientific materialism. in addition, Dr. Rick Strassman who conducted extensive experiments and research on DMT came away with a different view of reality–a reality which has more in common with Dr. Alexander’s view (e.g. religious overtones) than with Sam Harris’s model of reality. granted, McKenna and Strassman are no neuroscientists, but it’s very telling that their models of reality go against scientific materialism. “However, the deepest problem with drawing sweeping conclusions from the NDE is that those who have had one and subsequently talked about it did not actually die. In fact, many appear to have been in no real danger of dying. And those who have reported leaving their bodies during a true medical emergency—after cardiac arrest, for instance—did not suffer the complete loss of brain activity. Even in cases where the brain is alleged to have shut down, its activity must return if the subject is to survive and describe the experience. In such cases, there is generally no way to establish that the NDE occurred while the brain was offline. “Many students of the NDE claim that certain people have left their bodies and perceived the commotion surrounding their near death—the efforts of hospital staff to resuscitate them, details of surgery, the behavior of family members, etc. Certain subjects even say that they have learned facts while traveling beyond their bodies that would otherwise have been impossible to know—for instance, a secret told by a dead relative, the truth of which was later confirmed. Of course, reports of this kind seem especially vulnerable to self-deception, if not conscious fraud. There is another problem, however: Even if true, such phenomena might suggest only that the human mind possesses powers of extrasensory perception (e.g. clairvoyance or telepathy). This would be a very important discovery, but it wouldn’t demonstrate the survival of death. Why? Because unless we could know that a subject’s brain was not functioning when these impressions were formed, the involvement of the brain must be presumed. 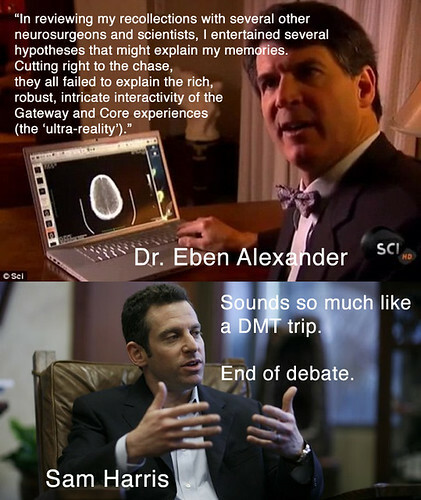 Actually, Sam Harris has has since clarified that he’s willing to debate Eben Alexander, just not on Alex Tsakaris’s podcast. He doesn’t like Alex because he feels that Alex unfairly attacked and misrepresented him. And from my experience, I could see reason for this. I’ve already seen some indications of Alex cutting and editing things in ways that censor and misrepresent others. Personally, I wouldn’t take Alex’s posts of Harris’s email messages unquestioningly at face value. i got here to go back the favor?.I am attempting to to find issues to improve my site!I guess its good enough to use some of your ideas!! Hi there to every one, it’s really a good for me to pay a quick visit this site, it includes helpful Information. This was posted by c4chaos on Wednesday, October 17th, 2012 at 10:38 pm. Bookmark the permalink.